PF Chang’s recently put on a cool little promotion. For a little over a month, if you dined in a PF Chang’s restaurant they gave you a card with your check. The card was a red, glossy type pull tab. If you pulled the tab off, it would reveal some type of discount or free item. The catch was that you could only use it at a future visit within the promotional timeline. Additionally, the card was only good if it remained unopened until the server did the honors himself. This past Saturday I was in Spokane for the NCAA Women’s Basketball Tournament. Misti (co-worker), Shaun (friend who works for ABC/FOX), and myself decided to eat a late dinner at PF Chang’s after we watched the Gonzaga men get upset by Wichita State. When my mom got wind that we would be eating there, she insisted on driving all the way from the north side of the city to our downtown hotel where she gave us two of the PF Chang’s promotional cards. We got to our table and after we ordered our appetizer I finally remembered that I had the cards. I presented them to our server. He quickly and unceremoniously opened the first one revealing that we would get 10% off our meal. Big deal. Definitely a little disappointing. But then he opened up the second one, this time a little slower, and my eyes grew big for a split second as the winning message appeared……..20% off our meal. Okay, we were definitely hoping for that $75 gift card that was one of the available prizes but I guess 20% off is better than nothing, right? (And no, we could not add the two cards together to get 30% off). Misti and I outside the Spokane P.F. 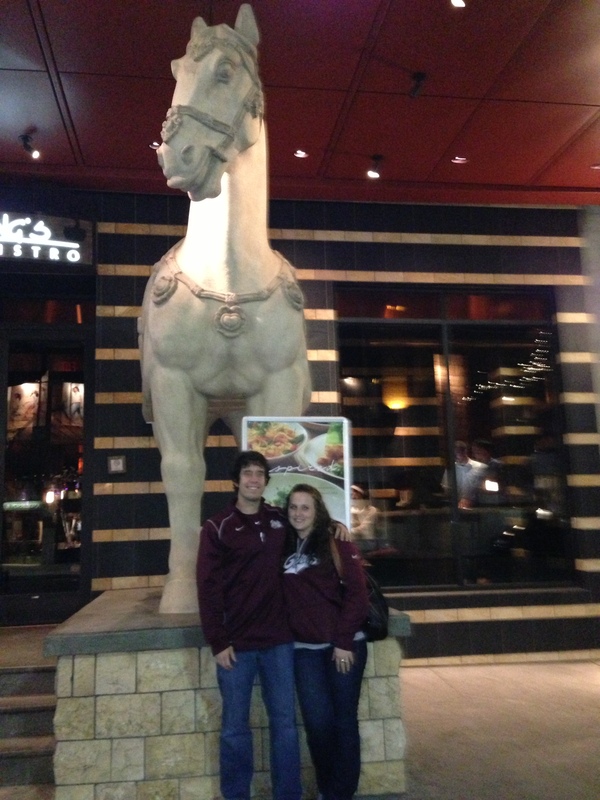 Chang’s in front of the famous horse. I bring this story up as a roundabout way of saying that I enjoy PF Chang’s. While I didn’t win big on their promotion, I still found it fun and thought it was a great idea. Besides good promotions, PF Chang’s just serves really good food. Their signature appetizer, the lettuce wraps, significantly blows any other competitor lettuce wraps out of the water. The freshness and crispiness of the lettuce combined with the warm, spicy chicken on top of the white rice noodles is a combination made in heaven. 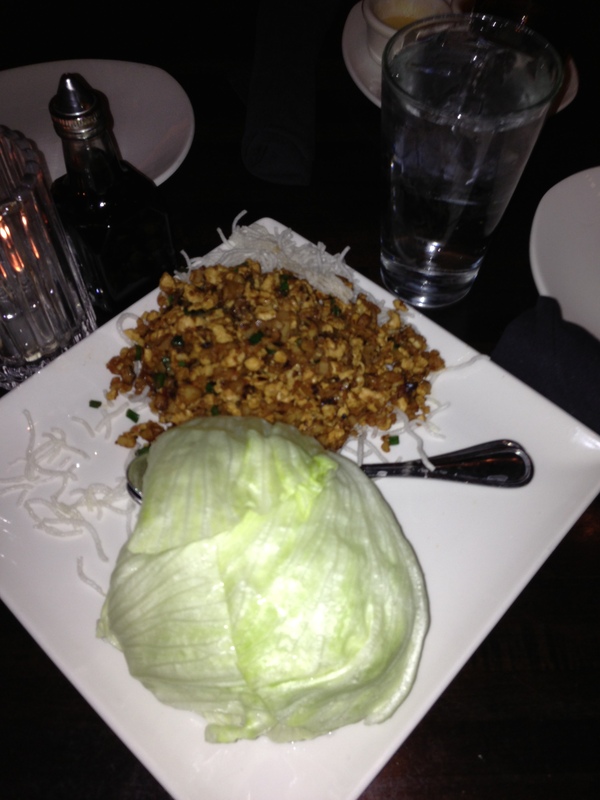 The delicious lettuce wraps we had this past Saturday. I have sampled many of the chicken, pork, and beef entrees on the PF Changs menu and I have to say that they are all fabulous. Each dish has its own distinctive flavor, chockfull of taste. The noodle dishes they serve are amazing. A family favorite of mine, the double pan fried beef noodles, make me so happy. Even the rice they serve stands out from rice at other places. They bring you out both white and brown rice and it compliments everything else so well. The rice at PF Changs just has a texture that is different and not to get too specific but it always sticks together just perfectly as well. Then of course the server always mixes a sauce to the liking of your table (mild, medium, hot) and that is always delicious as well. The entrees and rice we got during a visit in February. Whenever I go to a PF Changs, everyone in my party always orders a dish that they specifically like and then we eat family style. The times that I have gone with my family we always have a couple chicken dishes, a beef dish, a pork dish, and a noodle dish not to mention two big bowls of rice. I have fun making a bed of rice on my plate and then covering it with the noodles and meats and then topping it off with the special sauce. It makes for a yummy meal full of flavor and different textures. 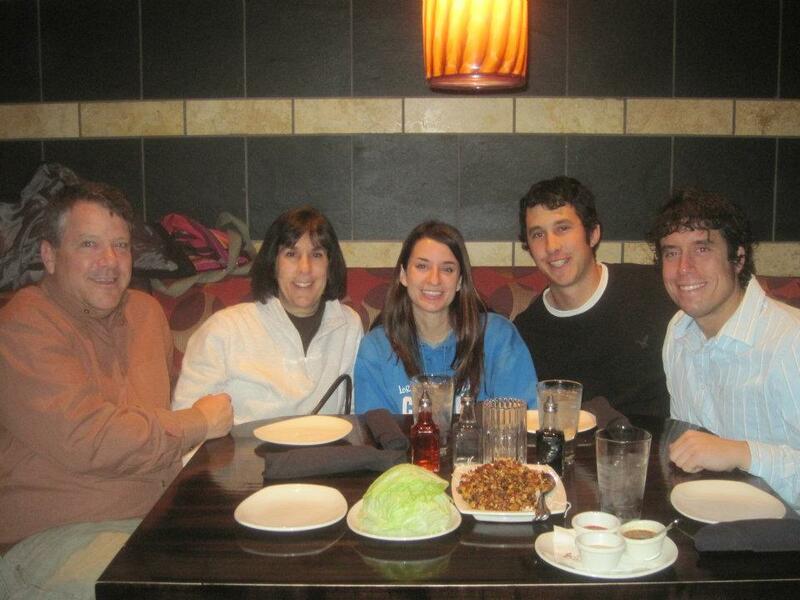 I have never once gone away from a PF Changs feeling like I did not eat fresh, quality food. My family loving life at P.F. Chang’s in November of 2011. Adding to my fondness of PF Changs are just the little things. Service is always great. The glassware and serving ware is eccentric and fun to drink/eat off of. The lighting and setup of the restaurant is relaxing. The distinct PF Changs smell is inviting. The whole China bistro concept the chain prides itself on makes for a fun dining experience. 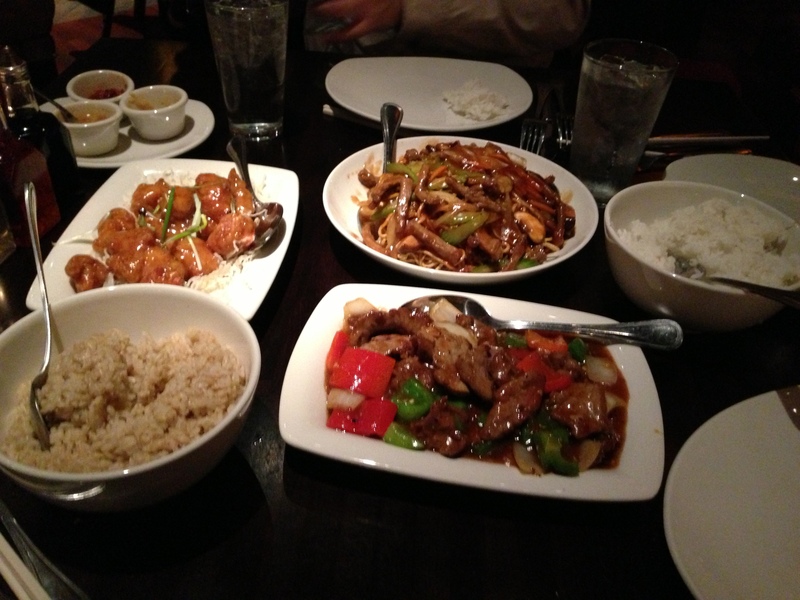 PF Changs is a major chain restaurant that you should really try if you have never done so before. While you won’t get to do the pull tab promotion (it ended on March 24) you will get to eat some amazing Asian food in an efficient, classy restaurant. Check it out when you GOT the chance, you will enjoy the experience. Don’t Blink.